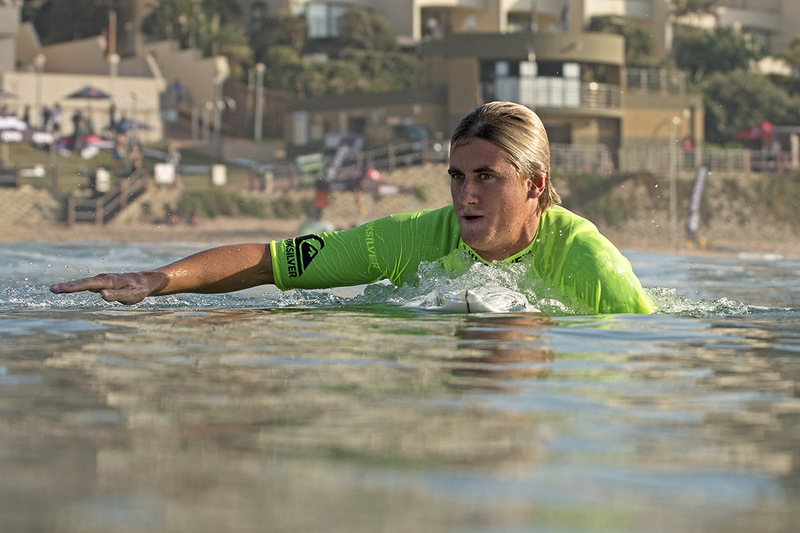 Umhlanga, Durban – Local surfer, Beyrick De Vries surfed his way to victory this weekend in the premier open men’s division at the second of three Quiksilver Get Free events. Over seventy of South Africa’s top competitive surfers were greeted with solid 4 to 5 foot groundswell for the final day of competition at Bronze Beach, Umhlanga. De Vries was a clear standout and looked very comfortable in every one of his heats throughout the two-day event at his local surf break. De Vries’ power surfing combined with his impressive air game proved too good for his competitors and clinched the title ahead of Capetonian, Michael February who placed second, Dale Staples of Westbrook in third place and Brandon Jackson also of Durban in fourth place. “It was so nice to win at my home break. I just got back from Los Angeles so have been a bit jet-lagged but really stoked with the win, thank god there were waves, Bronze was cooking today” said Beyrick. Day one of the event was called early due to the small swell and a rising tide. The last four heats of the Open Mens division were moved to day two, which produced near perfect competition conditions. “I’d like to thank all the local guys and my sponsors for all the support” a smiling De Vries added, taking home R8000, a top of the range Drift Innovation action camera, Skullcandy headphones and some stylish Neff gear. 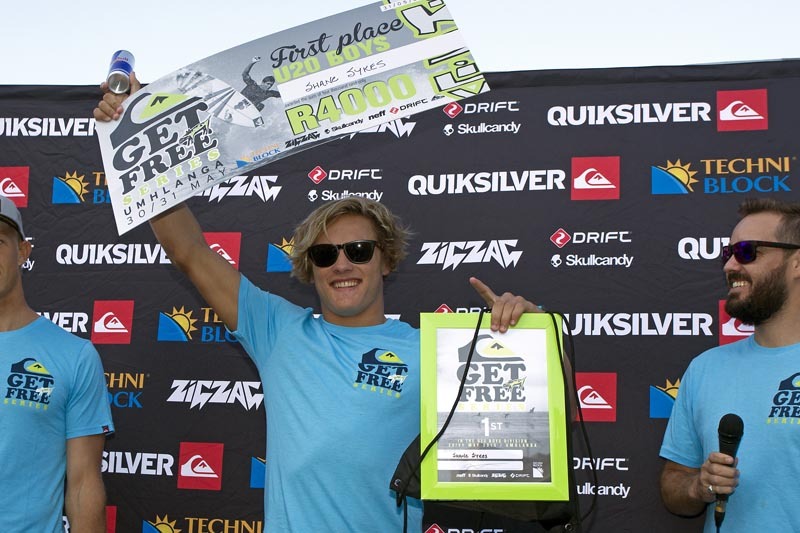 In the U20 junior boys division it was firm favourite, Shane Sykes of Salt Rock who stole the show winning a cool R4000. J-Bay’s Dylan Lightfoot placed a respectable 2nd while Matt McGillivray also of Jeffrey’s Bay was relegated to 3rd place. McGillivray who is back from a recent injury showed good form to find himself a podium finish, while Wade Simkiss from Umdloti finished in fourth position. Berea, Durban’s Sebastian Williams took the win in the U16 division. Williams stamped his authority and claimed the title ahead of Ethan Fletcher (Kommetjie), Jake Elkington (Hout Bay) and Adin Masencamp (Strand). Event sponsors, Quiksilver were very happy with the second event of the series, “We could have not asked for a better two days of surfing from a world class beach break with South Africa’s best surfers. Even though the first day of competition lacked swell and was difficult for the competitors, all competitors were not disappointed on the final day and nether were the spectators. With high explosive surfing in 4-5 foot clean conditions, we were very proud of this event and thank everyone that took part in making it happen. ” said Quiksilver Team Rider and Event co-ordinator, Brandon Jackson. The next and final stop of the Surfing South Africa 3A rated event series will take place in Port Alfred on the 29th and 30th of August and will be the final show down of SA’s top surfers. Supporting sponsors to the series include Techniblock sunscreen, Drift action camera’s, Skullcandy, Zigzag Surfing Magazine, Neff and RedBull. The Quiksilver Get Free Series offers a total of R108 000 in prize money as well as generous product prizes for competing surfers. GOING TO UKRAINE NOW? ARE YOU CRAZY? OR JUST PSYCHIC?